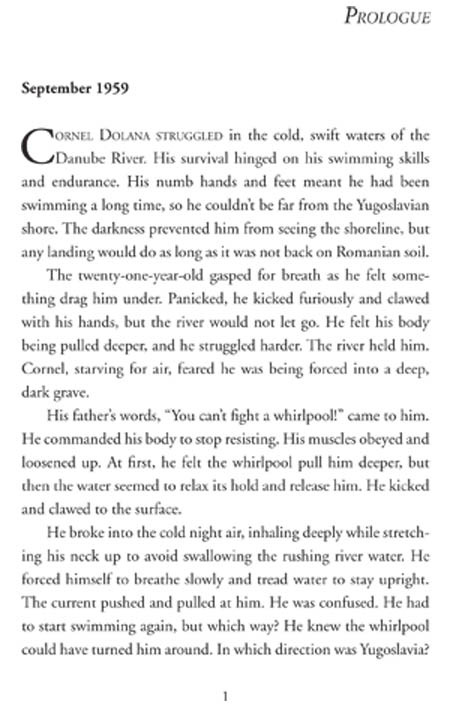 Cornel Dolana struggled in the cold, swift waters of the Danube River. His survival hinged on his swimming skills and endurance. His numb hands and feet meant he had been swimming a long time, so he couldn’t be far from the Yugoslavian shore. The darkness prevented him from seeing the shoreline, but any landing would do as long as it was not back on Romanian soil. The twenty-one-year-old gasped for breath as he felt something drag him under. Panicked, he kicked furiously and clawed with his hands, but the river would not let go. He felt his body being pulled deeper, and he struggled harder. The river held him. Cornel, starving for air, feared he was being forced into a deep, dark grave. His father’s words, “You can’t fight a whirlpool!” came to him. He commanded his body to stop resisting. His muscles obeyed and loosened up. At first, he felt the whirlpool pull him deeper, but then the water seemed to relax its hold and release him. He kicked and clawed to the surface. He broke into the cold night air, inhaling deeply while stretching his neck up to avoid swallowing the rushing river water. He forced himself to breathe slowly and tread water to stay upright. The current pushed and pulled at him. He was confused. He had to start swimming again, but which way? He knew the whirlpool could have turned him around. In which direction was Yugoslavia? Darkness was the only thing he saw, the rush of the river the only sound he heard. He made his choice, ordered his arms to pump and legs to kick, and set out. Each stroke was a cold agony. He felt enveloped in the force of the current as it pushed his body downstream. He fought panic that the river might be carrying him back toward Romania. His body had given all it could. Cornel could feel fatigue strangle his muscles. He could not let freedom slip away and dismissed the thought that he might not be making any headway toward the Yugoslavian shore. I’m strong, and the river already said it wouldn’t take me today, he said to himself. He forced his body to swim. Compelling desire to survive as a free man kept him going. Bushes brushed against his hands. Startled, he jerked but then felt his legs touch slimy rocks. Relief washed over him as he realized he was in shallow water. He grabbed the rocks and looked up. The sky was pale. If dawn was near, then he had been swimming five hours, much longer than he had thought it would take to cover a mile-wide stretch of the Danube River. A sound made him turn his head. Terror engulfed him as his eyes focused on three AK47s aimed at his head. In the silhouettes against the half-dark sky, the soldiers’ uniforms appeared to be Romanian. Cornel wanted to weep; I must have swum the wrong way when I came up from the whirlpool. He had started dreaming and planning in his early teens for a better life, one free of communism. Now, shivering from the freezing temperatures and fear, he thought, That’s the end of me! He braced himself for a bullet.